It is hard when one comes to a genealogical road block such as the one I have with my great great great grandfather, William Henry Luff. I've just met a professional genealogist and asked her about William and said I didn't think he married Elizabeth Gillespie, the mother of his three children as I couldn't find a marriage record. The first thing she asked me was "Did they have each child in a different place? That's what they used to do to keep an air of respectability." I laughed, as that is exactly what my ancestors did so at first it looked like they probably didn't marry. They had their first child in Thames, New Zealand, the second in Sandhurst, Bendigo Region, Victoria, Australia and the third child in Christchurch, New Zealand. But now after a lot of help I have found they probably did marry, and then told lies on every certificate as to the date and place of marriage. Maybe they knew an descendant would try and trace them 150 years later. The professional genealogist suggested I go back to London to find the elusive William Henry Luff. There was a family there which I thought he may have been connected to, but because I had no definite certificates with William's parents listed, and also differing birth years, I could only presume this. Now I think I am on the right track, but may need a couple more records to fully prove everything. These documents will probably never show up! I am now pretty sure he followed the gold rushes to set up grocery businesses and I know he was a miner when in Hokitika in 1868. He probably dabbled in mining at other places but I can not confirm this! Firstly get every official document you can. This includes birth, death and marriage certificates, hospital admissions, land purchases. Anything you can find. It may not be much as itnerants often didn't put down roots! You may have to search in America, New Zealand, and the different states of Australia to find these documents! Next start searching online historic newspapers. Find every reference to your ancestors name. Try searching under different spellings and forms of the name. Use quotations, so the databases search for the whole phrase. For example I searched under, "William Henry Luff" "W. H. Luff" "Henry Luff" "William Luff" "W. Luff" "H. Luff" "Mr. Luff" "Luff, William Henry" "Luff, W. H." and finally once I knew I had to find something in a very small time period I just used the word "Luff" I also searched under "Lutt," "Lull," and other variants because often text conversion programs get things very wrong. When you do find a name that matches your ancestor, put the reference into a timeline and write how it could or couldn't be your ancestor. At this stage you don't know for sure, but later you might just prove it is him or her. If your ancestor had a common name like Smith or Jones, give up now! That is unless he was Jabez Hiram Jones, which might just be ok! You may find similar things to me - advertisements asking for a brother to come and meet your ancestor after they got off the ship. It may even name the ship they came on! Go back to the UK and search over there and you may just find the family in the census with the brother right there in front of you. Sometimes the other family members might have more unusual names that your direct ancestor which helps a lot. Your UK ancestors may mysteriously vanish from the census records (because they are on the other side of the world of course) and sometimes reappear again having found no gold. As well as establishing your ancestor's possible movements from newspapers you can look at the inwards and outwards databases for travel. Try Family Search which has the passenger lists for many ships into New Zealand. Try the online Victorian passengers database which has inwards and outwards passengers from the Victorian gold rushes! Sometimes they may only be named as Mr Luff, which isn't that helpful if the ancestor has a common name. Also try the Goldrush database by Kae Lewis to see if your ancestor had a mining licence. Often family members are all together hunting for gold. But like my ancestor many just moved into the area to set up a grocery business or other business in order to supply the thirsty, hungry miners! Those people do not appear in this database. Repeat all of the above newspaper and document searches for any other gold chasing family members you may have found to try and prove that you have located the correct person, who happens to be your ancestor. They may be a witness on a marriage certificate or other document which is just what you need to prove things conclusively! Gender: Male Christening: 06 APR 1831 Saint Matthew, Bethnal Green, London, England (his birth on Ancestry.com gives his father John Luff's occupation as surgeon). Click here for some great history about the St Matthew's parish. The father of the above children, John Luff, apothocary, was living at 170 High Street, Shadwell and got contents insurance for his property from Sun Fire Office. click here This is not far from Bethnal Green. 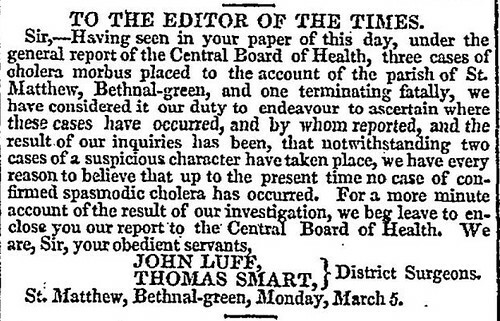 The father of this family, John Luff, had a letter to the editor of The Times (London) on 6 March 1832 about the cholera epidemic he was dealing with as district surgeon in the Bethnal Green area of London. Your local library can give you access to these overseas newspapers and often they are available from the comfort of your home. John died tragically in 1833 of phlegmonous erysipelas (A type of inflamatory skin disease often caused by bacteria such as strep. This is a form marked by invasion of the subcutaneous tissues, with the formation of deep-seated abscesses). He left a widow and 11 children destitute. An ad in the newspaper begged for monetary help for this family. This explains why the children didn't go on to become surgeons or high up people themselves, instead working as shopmen and then probably going gold chasing (if I have the correct family). John Luff was originally from the little town of Downham Market in Norfolk. Another place for me to search eventually! This family is in the 1841 census for the district of Bethnal Green, Middlesex, minus the father John. The family then appears to be split up for the 1851 census with Henery Luff born 1831 in Bethnal Green, London, still residing in London. He was a shopman and was basically living with children and a servant. I have no idea what the relationship is between Henry and the Jones family listed below. William Henry Luff was mentioned as wanting to meet up with his brother Thomas in 1853. He had just got off the Prince Regent from London arriving in Melbourne approx November 1852 Could this be his brother Thomas Charles Luff? Thomas Charles Luff disappears from the 1851 UK census so maybe he went to seek his fortune in the Victorian gold rushes which started in 1851, going back to England before the 1861 census when he reappears in the UK. An ad a few months later almost confirms that the two brother's were there together during the gold rush. A package went missing that should have been addressed to H. Luff or T. C. Luff in The Argus (Melbourne) on 18 October 1853. William Henry was more often than not, known as Henry. And the middle initial indicates possibly Thomas Charles Luff. Bingo!!! It seems highly likely, but how to you prove it? Then I found the first advertisement (mentioned above) for the Luff brother's to pick up their parcel and it confirms that the man's name is Thomas C. Luff late of Bishopgate Street, London, and the other man is Henry Luff. Is now looking good! I definitely think my William Henry Luff is connected to Thomas Charles Luff, their father being John Luff, surgeon of Bethnal Green. (note I have ruled out many other families with similar names to get to this point of certainty). Another letter arrives for a Thomas Luff in 1854. The fact they have to keep advertising his letters suggests he is moving all the time, following the gold rushes in Victoria, or, at the very least, has no fixed abode. In April 1855 a Thomas Luff (possibly our Thomas Charles Luff but I can't prove it unless I have the court case notes which often give middle names) gave evidence in a court case. In any case it is a great example of the life many of the men led in and around the goldfields. This Thomas was working at The Eagle Hotel, Ballarat, laying a floor with Edward Button who was a carpenter. Ai Poy, (a Chinese man), came in for "grog" and had 6 pounds in a sash around his waist and some English men followed him out of the hotel, held him down and stole it, but Edward Button was named as the thief by two Chinese. Thomas claimed Edward never left his work. Thomas though went to watch the row. The court found Edward guilty and he was put to six years hard labour. They obviously didn't believe Thomas's testimony! Click here for more details. In The Argus (Melbourne) dated 11 October 1855 a T. Luff has an unclaimed letter. Is it our Thomas Luff again? The fact the letter is unclaimed suggests he has moved on from the Melbourne area or to a different gold field. This may indicate he has returned to England by this time, but I can not find an outwards passenger listing for him. William Henry Luff or a Henry Luff born in Bethnal Green, London in 1831 is not present in the 1861 UK census. This confirms that he has either died or has left the country for Australia or New Zealand or another country. As we now know, he is most likely in Australia! It looks like Thomas Charles Luff was in the 1861 census in England. Did he seek his fortunes in Australia and then go back home without success, like many other miners? There was however a Thomas Luff aged 30, who travelled from Melbourne to Otago, NZ in September 1861 and appears in the Goldminers Database click here. He was also listed as donating 5 shillings to the Tuapeka Hospital, near the Gabriel Gully rush of that time. The ad appeared in 1862, but Thomas Charles Luff, appears to be back in the UK by that time. These are two different men as the UK 1861 census took place on 7 April 1861 and Thomas Charles Luff aged 33, born in Bethnal Green, London, appears, as follows. The next clue I got was from a website of outwards passengers from Victoria, Australia. There was a William Luff aged 27 who left on the Storm Cloud for Otago in Feb 1863, which puts his birth date at 1836 or thereabouts. DISSOLUTION OF PARTNERSHIP The business hitherto carried on under tho Firm and style of Luff, Slesinger and Co, Produce Merchants,"George-street, Dunedin, has this day been devolved by mutual consent. All debts due by the said firm will be paid by Samuel Slesinger, who will carry on the business as before. And, all debts due to the said firm are requested to be paid at once to the said Samuel Slesinger, whose receipt will be a sufficient discharge. Witnesses -WM.THOS. DUNLOP, JAMES TORRIE, Dunedin, 6th May, 1863. 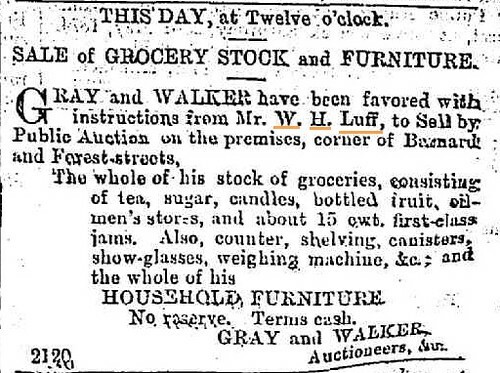 My William Henry Luff always appears in business ads for this cabinet making business in Christchurch as W. H. Luff, nothing else, so alarm bells went off when I found this ad. Also he is listed as a shopkeeper selling produce and groceries when in Victoria later in life, listed again as W. H. Luff. There is no mining licence record for William Henry in the Otago area however. He may have headed for the Otago Goldfields which had a rush in or maybe he went back Australia soon after arriving in NZ, thinking it was not for him? It is likely he stayed in NZ however. The obituary for his business partner Samuel Slesinger suggests he was on the Melbourne goldfields at the same time as my W. H. Luff. He was a veterinary surgeon and died on George St, the same street as his grocery business in 1863. When you look further into his life, he was made bankrupt in 1862 in the Melbourne region. Click here. It is likely he set up the grocery business once in Dunedin instead of a veterinary business as it was a way of getting fast money in order to go back into being a veterinary surgeon once again. Then I found a record for another passenger on the Storm Cloud, the same ship as William Luff. Dah dah! Proof, that W.H. Luff and William Luff on the Storm Cloud passenger list are one and the same person and that they either travelled with Samuel or met him on the boat coming out to New Zealand. The other partner in the grocery business was also on the same boat as well! It seems that W. H. Luff stayed on in a grocery business as there was an ad in the Otago Daily Times on 22 July 1863, "WANTED, for a youth. A situation in a store or office. Apply Luff's produce store, George Street." Click here for the ad. William Henry Luff was not in Dunedin very long it seems as he failed to claim a letter and this was advertised twice. Once as a letter not claimed as of 31 December 1863 and then as of 31 March 1864. So he still hadn't claimed it and it was still sitting at the Post Office. So where did he go? Click here. It is likely he went to mine on a goldrush, either in the Otago district, or the West Coast. It appears he had no mining licence however, so he can not be traced accurately. William's death certificate, which is largely blank and/or incorrect, says he arrived in the country in about 1866 (which I now think is three years out). There is a Henry Luff who conveniently arrives on the ship Canute into Lyttelton in 1867, but there are no furthur details about the man. On 1 Feb 1871 a Mr H. Luff left from Lyttelton on the Merope for London. This man didn't marry in the colony or have children and was not mentioned in the papers at the time, so left no record, and just disappeared back home again. This is probably a different Luff to my one, as mine was in Thames in 1871 where his daughter was born on 25 March 1871. There was a Henry Luff who had failed to claim a letter which had been received at Hokitika in December 1867 and was advertised as not being claimed on 7 April 1868 in the West Coast Times. Was this for our W. H. Luff or for the other Henry Luff that came in 1867 and left in 1871 on ships to and from London? William Henry Luff's death certificate suggests he was in the West Coast in the late 1860s, in the Kumara area. William and Elizabeth were in Hokitika from 6 March 1868 according to a intention to marry record (see 1868). I hit the jackpot this year with an intention to marry record from National Archives [Archives Reference: ] BDM20/13 Pg 398/153. It says that William Henry Liff [Luff] aged 28 and Elizabeth Gillespie aged 30 were intending to marry at the Presbyterian Church in Hokitika with Rev J. Gow (mispelt Good). The record was dated 9 March 1868. They had been resident in the Hokitika area for at least three days! William was listed as a miner (there was a question mark next to this, suggesting the writing was hard to read) and they were listed as a batchelor and spinster. After receiving this record I finally had proof that William Henry was into gold mining. I couldn't find the marriage certificate however! Then the professonal genealogist who I mentioned earlier, she found a marriage for an Elizabeth Gilespie (note spelling mistake which is why I couldn't find it), to a William Peterson (not my ancestor's name). I received the certificate and it was William Peterson, goldminer and batchelor, aged 28 married Elizabeth Gilespie, sevant and spinster, aged 30 on 9 March 1868 (same date as intention to marry record). They were married at the "House of Rev. John Gow, Sack? Street, Hokitika" and the witnesses were James McGoldrick, Okarita (Okarito) and Mary Eans?, Okarita. I am confused about this. Did the minister John Gow make a huge mistake in the records? Did Elizabeth marry a different man (there was a William Peterson living in Hokitika at this time) - this is unlikely as everything else but the name matches the intention to marry record. The genealogist thinks there has been a massive transcription error and I need to look at the original parish record (I still haven't managed to get this as yet). Then I wondered why, a few years later, they gave different marriage dates and places? Was it just for fun, and for a bit of a laugh, or was there a reason? Were they on the run, moving all the time and giving different details? We will probably never know. It seems likely that the couple had travelled from Okarito to Hokitika to get married as the two witnesses were from Okarito and there was goldmining there at the time, from about 1866 and a few had struck some gold but many failed. Click here There was also a Gillespie's beach near Okarito which still exists today. This is where James Edwin Gillespie, a goldminer, discovered gold in 1865. Whether Elizabeth was related to him is unknown. It is from this point on that I can trace the couple's movements with much certainty as I have birth and death certificates. The next time my William Henry Luff appears for certain is in his daughter's birth certificate (Eliza Jane Luff) from 1871, at Grahamstown, Thames. He was listed as a storeman again! The Thames goldrush started in about 1867, so William was trying his luck again at a different place and probably set up a grocery business again to make sure he at least had some cash coming in. He didn't have a mining license in this area either! I feeling that he shunned documents, even though he could read and write. Amazingly I stumbled across the Luff family's journey back to Melbourne. They left the Port of Auckland on 19 September 1872, aboard the steamer Hero (851 tons, Captain Logan) and arrived at Sydney on 24 September 1872. They departed Sydney on 27 September 1872 travelled via Newcastle and arrived at Melbourne on 4 October 1872 with Mr and Mrs Luff and Eliza Luff aged 1, who would have been in steerage as they are not named as cabin passengers in the newspapers, only listed in the Victoria inwards database. This all fits in perfectly! William Henry then appears in 1873 in Barnard Street, City of Sandhurst (now called Bendigo), County Bendigo, Victoria with the birth of his son John Thomas Luff on 7 July 1873. William Henry Luff, storekeeper aged 38, born London, England (birth year approx 1835) . Married 6 March 1869 in Sydney, Australia (a outright lie!). Sibling: Eliza, 2 years. Elizabeth Luff, formerly Gillespie, 36 years, born Glasgow, Scotland (birth year approx 1837). There is then an ad for the sale of his business and all grocery goods belonging to it, as well as household furniture. He was situated in the corner of Barnard Street and Forest St, Bendigo, the ad was dated 15 May 1874 (Bendigo Advertiser). If you look on Google Earth there is still a very old historic shop there to this day! He then moved to Prahran, Melbourne and set up another grocery business but sold up again near the corner of Commercial Road and Chapel Street, Prahran district of Melbourne. He sold out to "move up country" in January 1875. I tried to find the Luff family's journey back to New Zealand but can't find it as yet. However they were back and settled in Christchurch by August 1875 judging by the following ad published in the Star 26 August 1875! The family then appear in Christchurch where their son James Robert Luff was born in 1876. Details on the certificate: Born 26 June 1876 at Whateley Road (now Victoria Street), Christchurch. Father William Henry Luff, Cabinet Maker aged 41, born in London (birth year approx 1835). When and where married, 14 February 1870, Sydney, N.S.W (a big fat lie!). Mother: Elizabeth Luff formerly Gillesbie aged 37, born Glasgow (birth year approx 1839). One of the few documents we can find for the Luff family is a hospital admission for Mrs Luff aged 37, admitted on 07-11-1876 for the disease gastritis and discharged on 19-11-1876. This made her birth year more like 1829, not 1839. I think they enjoyed lying about their ages!! Her husband was Henry Luff, cabinet maker living on Papanui Road. She was listed as Scottish and her religion was Presbyterian. They were charged 2 pounds for her treatment. William Henry advertised a double fronted shop to rent in the Press on 22 Feb 1877. Later in the Star on 2 June 1880 he advertised a shed and stables to rent on Victoria Street. And in the Star on 27 Dec 1881 he advertised two rooms to rent, furnished or unfurnished on Victoria Street. John Thomas Luff died on 2 August 1879, at Victoria Street, Christchurch aged six of Diptheria which he had for 11 days. A terribly tragic event for the family. William Henry Luff, Cabinet Maker and Elizabeth Luff formerly Gillespie. He was buried in Christchurch Cemetery in the Church of England section (now Barbadoes Street Cemetery). All the moving around and chasing his fortune, didn't pay off for William Henry Luff. He went bankrupt on in 1882 as advertised in the Star 7 December 1882. William Henry Luff died on 31 December 1883 aged 51 (birth year 1832). He died of inflammation of lungs, 5 days. He was a Cabinet Maker living in Yaldhurst. Buried at St Paul's, Papanui (in an unmarked grave, suggesting he was a pauper). His wife was listed as Elizabeth Gillesby who he married at age 37 on the West Coast of New Zealand (i.e. about 1869) . Father and mother listed as unknown. He was born in London and had lived in NZ for 17 years (1866). His children were 1 male, aged 7 years and one female aged 9 years. The agent for wife was John Leckie of Christchurch. Elizabeth Luff, formerly Gillespie was 76 when she died on 7 December 1905 at 49 Aikmans Road (birth year 1829). She died of ???? morbus, Exhaustion, Anaemia whch she had for 17 years. Her parents were unknown and she was buried at St Paul's Papanui. She was born in Glasgow and had been in NZ for 50 years (meaning she arrived about 1855) and married William Henry Luff 40 years ago in Kumara, West Coast, NZ (about 1865). She had one male child aged 29 and one female child aged 34. Her son J. R. Luff of Sydenham was the informant. Obviously she didn't tell her children much about her past as they had no idea of her parents names. After doing all this research I was left with some extra information which is worth noting. This includes other William Henry Luff's I found during my research. W. H. Luff arrived on the Ceylon into Adelaide in August 1850. Click here. This particular William Henry Luff from Bristol married Fanny Maria Haslam in 1863. This is a completely different person to my ancestor. There was a John Luff who was murdered in Victoria in 1855 and his brother William Luff was present. This is probably a different family again as I got the death printout for John Luff and he was aged 24 when he died, much younger than the John Luff brother of my William Henry Luff in the 1841 census in London. No birth place or parents listed. Click here. In Sydney in 1860 there was a William Luff (miner of Wattle Flat) who went bankrupt. Click here. 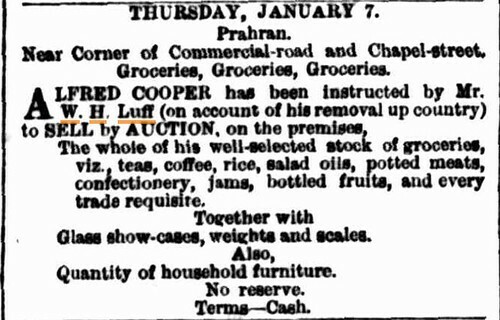 W. H. Luff had two packages delivered in August 1863 to Port Phillip. Which W.H. Luff was it? Click here. My W. H. Luff had probably already emigrated to New Zealand the February before this report in the newspaper. Maybe he never picked up his package? Maybe it was for the Bristol born W. H. Luff. I also was left with a lot of records for Thomas Charles Luff and could follow his life back in England. A Thomas Luff arrived on the "Bride" into Port Phillip in Dec 1852. Is this the other Thomas Luff who was slightly younger than Thomas Charles Luff of London? He was in the 1881 census as a Canteen Manager (Inn Keeper) with wife and family. Thomas C Luff, aged 62, born Bethnal Green, Grocer, unemployed. What an amazing research journey Bel. That well laid out timeline is a great idea Your W. H. Luff certainly got around didn't he!